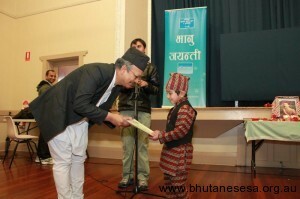 Bhutanese and Nepalese communities in South Australia again came together to celebrate the 199th birth anniversary of the first Nepali language poet Bhanu Bhakta Acharya July 14. Over 500 Bhutanese, Nepalese and local residents participated in the Bhanu Jayanti function this year organised jointly by Bhutanese Ethnic School and International Nepali Literary Society (INLS) – Australia. Apart from showcasing some literary talents but dancing and singing also mark the event. Young children, who have been attending the Bhutanese Ethnic School, performed dances in traditional Nepali songs. Bhutanese Ethnic School was established in May this year with the objective to help the Bhutanese children to learn Nepali language and culture. Over 60 children are currently enrolled in classes that runs every Saturday. Over two dozen writers recited their poems, gajals, songs and short stories. It was interesting to note that even children as young as 6 came forward to recite their poems. Some senior members of the community read out lines from the epic Ramayana. Wrapping up the four-and-half hour programme, Nepalese businessman in Adelaide Deepak Bista said he felt new Nepal in Australia after the arrival of Bhutanese who have brought with them the enthusiasm to preserve, protect and promote Nepali culture and literature. “We had never been able to organise such great events before the Bhutanese community came,” Bista said, adding he is ready to extend all his helping hand to preserve Nepali culture in this land. Treasure of BAASA Jeevan Koirala said he is encouraged by the overwhelming participation from community. He said even larger community participation is expected in future. This is the fourth Bhanu Jayanti celebration held in Adelaide by the resettled Bhutanese community. Since last year, they have joined with INLS to organise literary events.